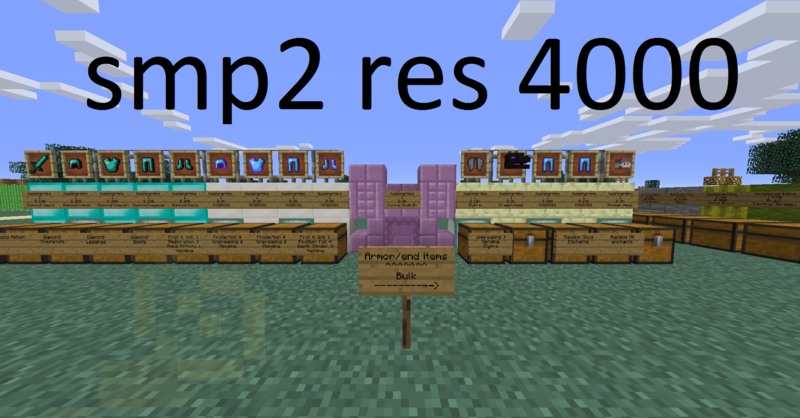 Hey all, I have started a new shop on res 4000 on smp2. I am currently selling both god armor and unenchanted armor, shulker boxes, bulk blocks, enchanted elytra, dragon heads, shulker heads, and a few other items. If you have any questions post them down below otherwise head over to 4000 on smp2 to check it out for yourself. Unenchanted diamond gear priced at 50r a diamond! Nickblockmaster, Gawadrolt, Raaynn and 2 others like this. Did i win a prize for being the first visitor ? prices so i dont have to go there? You're right, I have reduced the price to 3k. bump, lots of prices have been lowered, including god armor and elytra. Hey benny, I know you are excited about your shop but I would appreciate you not advertising it on my thread for my shop. Thanks. It's ok, don't worry about it! can i ask you to save me a set of god armor? I am currently out of town and i can pay friday Thanks! Will do! Ill put it in a separate chest for you to the left when you spawn on res 4000! Paid and picked up thx! bump, lots of shulkers still in stock, elytra will be restocked soon!